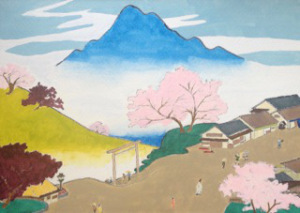 The contemporary Japanese artist, Sawako Utsumi, who hails from Northern Japan, once more creates a lovely art piece. 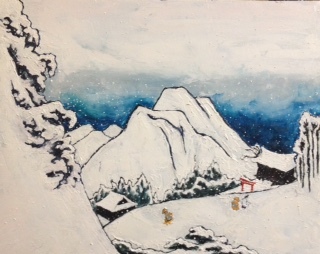 Spiritually, her background is based on Shintoism and tinged with Buddhism based on the cultural legacy. Yet, in general, the Shinto faith predominates despite paying deep respect during her visit to Buddhist temples. 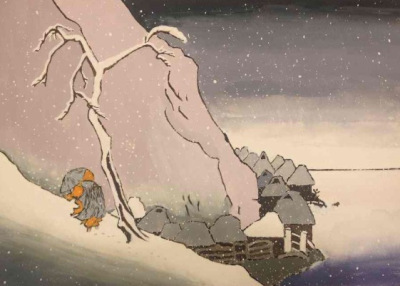 However, aspects of Christianity also appeal to Utsumi, even if this is in the cultural realm and based on small Christian churches appearing like folk Shintoism. Unsurprisingly, Fountains Abbey in North Yorkshire appealed greatly to Utsumi based on visual images of this Grade I listed building. 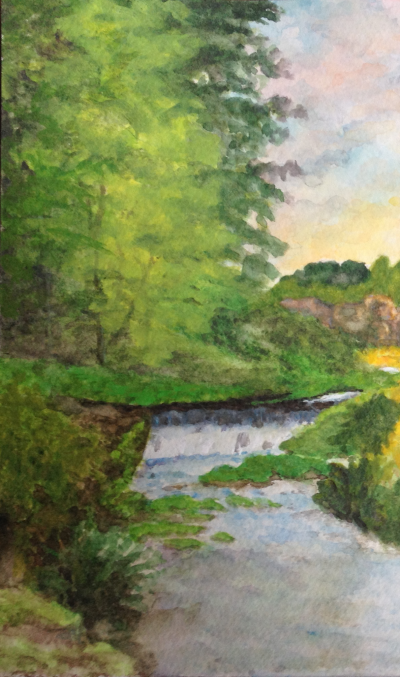 In her mindset, the terrible events of the Dissolution (1536-1541) – or the Dissolution of the Monasteries – can be understood, to a degree, by the stunning grounds and buildings that remain of Fountains Abbey. 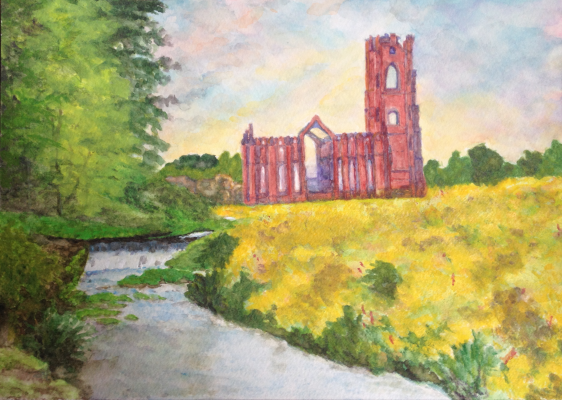 This relates to the legacy of the spiritual effect that Fountains Abbey is still blessed with despite the terrible events of the Dissolution of the Monasteries. In other words, the secularization of modern-day Japan and the United Kingdom are creating a religious vacuum that is being entered by new “soulless cultures.” The upshot of this is that major Christian Cathedrals in the United Kingdom – just like potent Buddhist temples and Shinto shrines in places like Koyasan, Kyoto, Nara, Nikko, and others – are important popular windows into a past that is often far-away from everyday life. Hence, these major centers of religion in Japan and the United Kingdom are still attracting countless numbers of people; despite vast numbers of ordinary Buddhist, Christian, and Shinto holy places struggling to attract worshippers in big numbers. However, often people who visit or pray are disconnected with the real tenets of the respective faiths based on secularization and modernization. One can only imagine the utter devastation and disconnection felt by many Christian holy people and lay people during the Dissolution of the Monasteries. Likewise, in post World War Two in the land of the rising sun, it is clear that Buddhism and Shintoism were put on a back burner. This is based on the demands of America put on Japan and the collaboration of Japanese political elites. Therefore, the new mantra focused heavily on modernization and high technology fused with many precepts that apply to Confucian logic in the realm of ethics and educational attainment. Hence, just like Shinto focuses on ancestors, Utsumi witnesses Fountains Abbey based on a plethora of different factors. For example, the spiritual realm of Fountains Abbey survives both the Dissolution of the Monasteries and modern-day secularization. Therefore, despite Fountains Abbey being but a shadow of a once thriving Christian holy place, just like Shinto ancestors that have long perished, the spiritual psyche remains potent based on the connection of the senses. Utsumi is utilizing the life of the river by imbuing this flowing continuity inside the remnants of what is left of Fountains Abbey. In this sense, the power of nature in Shinto is a duality of the river within the spiritual mindset when visualizing – or visiting – the delightful Fountains Abbey. In other words, despite the passages of time the spiritual dimension of Fountains Abbey remains potent – just like nature – despite the countless upheavals done by humanity. Overall, the end result is a delightful art piece by Utsumi who is fusing many themes. 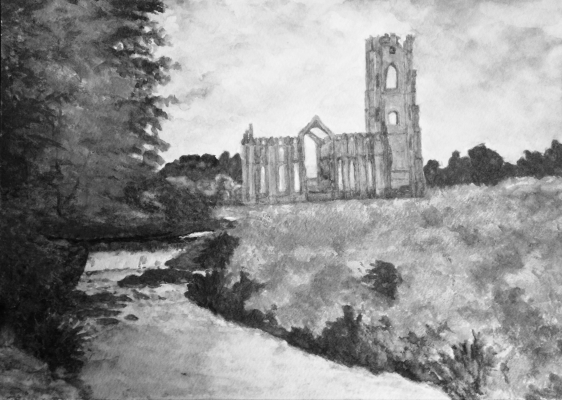 This is witnessed by the equal importance of the flowing life of the river that represents the spirituality that Fountains Abbey is blessed with, despite the terrible events of the Dissolution of the Monasteries. 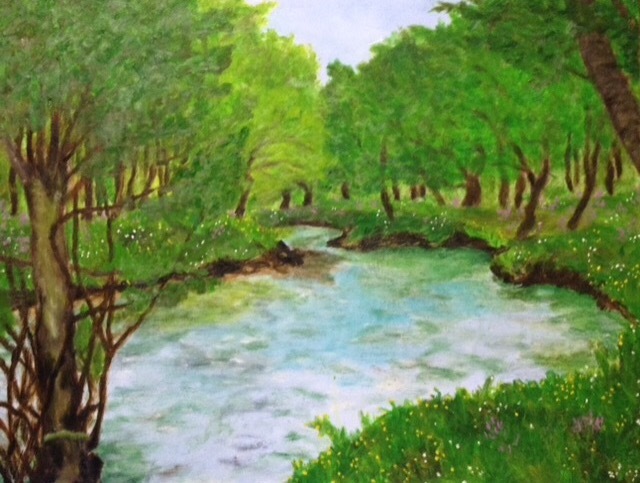 Therefore, nature and spirituality come together to create a multi-dimensional effect to this gorgeous art piece by Utsumi.